Alsace has been celebrated for its lovely, dry white wines for centuries, but it has gained a reputation for enticing traditional method sparkling wines in recent years. 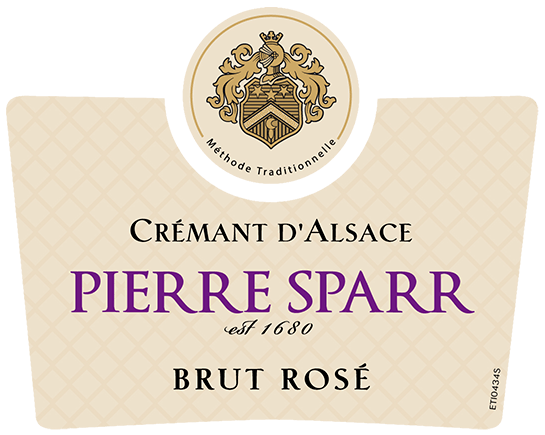 In the heart of Alsace’s finest district, the Haut-Rhin, Maison Pierre Sparr follows a 300-year-old tradition of winemaking that began during the reign of King Louis XIV. The devotion to the land, the attention to the smallest detail and the uncompromising quest for excellence is in every bottle bearing the Sparr family crest. Dates for the beginning of harvest for each Alsace AOC are set by decree, generally 100 days after the median date of flowering, at the time when the grapes display the best sugar-to-acid ratio. Intended vineyards for sparkling wine must be declared in advance of harvest and must be picked by hand. Grapes destined for Crémant are generally picked a few days before those for still wines in Alsace. Whole-cluster pressing; first fermentation occurs in temperature controlled, stainless-steel vats, transforming the must into still wine. Six months later, wines from hillsides and valley floor are blended to achieve the distinctive flavor profile of the rosé. Blended wine is then bottled with a specific yeast added to relaunch the second fermentation in bottle. The wine rests on lees a minimum of 18 months prior to disgorgement. Finally, the dosage is added to provide the particular brut style of this sparkling wine. Salmon pink color; fresh aromas of soft red berries, predominantly strawberry and raspberry. On the palate, round and fruity with hints of peach; the flavors are intense, with lively acidity framed by a well-made structure and delicate bubbles. The finish is smooth, clean and dry. Light and lemony with fine bubbles and notes of strawberry, peach, honey, rye crust and waffle cone. Pierre Sparr Crémant d'Alsace, Reserve Brut Rosé: Crémant ... is one of the best-priced gems in the winemaking world—delivering complexity and finesse ... This is one of my favorites for its red raspberry-cherry-strawberry palate and creamy texture."